This little-known gem was mishandled upon its original 1970 British theatrical release and died in video obscurity. 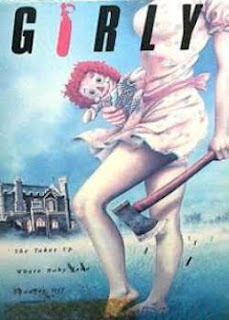 On video, it was simply called Girly, and aside from having awesome cover art, the movie probably isn’t what most horror fans thought they were getting when they rented it. Girly plays like a mutant hybrid of Harold and Maude and Spider Baby. As such, it isn't much of a horror movie but is a superior black comedy. A bizarre “family” lives in a secluded castle (in reality Oakley Court; probably best known as the castle from The Rocky Horror Picture Show). The family consists of Mumsy, Nanny, Sonny and Girly. Although Sonny and Girly are nearly adults, the family insists on functioning within their prescribed social roles; Nanny does the housework, Mumsy is the authority figure and Sonny & Girly must play games that they’re obviously too old for while wearing school uniforms that they’ve long ago outgrown. In fact, Mumsy and Nanny do everything within their power to keep the children happily regressed. However, Girly cannot hold in her impending womanhood much longer and her sexuality is always bubbling just underneath her childlike façade. Sonny and Girly frequently venture to the outside world and coax drunks and vagrants into becoming their new "playmates." Their new friends are brought back to the castle and forced to partake in children’s games. When the new playmates refuse to follow the rules or they grow tired of the games, they are promptly “sent to the angels.” Things change when their latest acquisition (who is only ever referred to as “New Friend”) plays the game a little too well and the family structure starts to crumble. Girly (Vanessa Howard) perfectly combines innocence and madness into a body that looks great in an undersized school uniform. The film’s obvious message about the sexual revolution’s impact on the post WWII family is very conservative and dated, but the good news is that you don’t have to agree with the underlying message in order to enjoy this movie. The movie isn’t terribly graphic, so when the gore finally appears on-screen, it packs even more of a punch. And there’s always something a little creepy about children singing a stupid rhyming song before somebody is murdered. For years there have been rumors that Girly will be getting a DVD release, but time and time again the company that holds the rights hasn't gotten off their stupid asses to do anything about it. For the foreseeable future, the only way to see Girly is to track down a VHS copy. If you're patient and willing to shell out the money, you'll experience a twisted little movie that you can hold over your friends' heads while you tell them how much cooler than them you are. And isn't that what horror fandom is all about?